There is an increasing demand for scientific support on climate-related decisions, in particular for providing societies and policy-makers with reliable and up-to-date information about atmospheric greenhouse gas (GHG) emissions and natural sinks. The Global Carbon Project now reports annually on the evolution of CO2 sources and sinks, their uncertainties and the resulting Global Carbon Budget, in phase with the United Nations Framework Convention on Climate Change (UNFCCC) annual Conference of the Parties (COP). Global stocktaking as defined by the Paris Agreement further requires information about regional GHG budgets that should be consistent with the global budgets and regularly updated. Still, the latest global carbon budget (LeQuéré et al., 2018, ESSD) estimates a budget imbalance (knowledge-gap) of ca. 2.1PgC each year (Figure). Top-down and bottom-up estimates also show important discrepancies over different latitudinal bands and a non-negligible fraction of the global carbon budget variability remains to be captured by land and ocean models. This underscores the need for regional studies to better constrain key processes/regions in the global C-cycle. This pilot project from ESA-CCI aims at supporting, in cooperation with the GCP, the scientific synthesis and assessment activities of regional carbon budgets and their drivers of the ‘REgional Carbon Cycle Assessment and Processes’, phase 2 (RECCAP-2) project by making use of regional cuts of annually updated global terrestrial and ocean carbon models, and atmospheric CO2 inversions, taking stock of new satellite-based surface monitoring products of climate and ecological variables now available within the framework of ESA-CCI. To respond to the demand of ESA and other space agencies for the better appropriation and effective use of remote sensing products in climate science. Here specifically, we will use a variety of remote sensing products to directly constrain carbon fluxes in data-driven models, and to be used as input or to evaluate process-based ecosystem models. 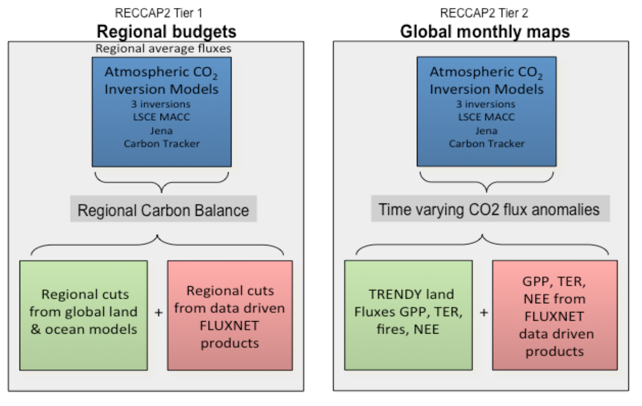 The project is based on CO2 fluxes data-streams from three different approaches to deliver annual updates of land-atmosphere CO2 fluxes at global and regional scales (Tier 1), consistent with the global carbon budget assessment from the Global Carbon Project (GCP) and with regional details in space and time to analyze the underlying drivers (Tier 2, Figure 2 below). Output of “data-driven” bottom-up approach machine learning methods like artificial neural networks or regression tree ensembles in the FLUXCOM project. Figure 2: Approaches to global and regional scale land-atmosphere CO2 fluxes. These three approaches are largely independent; even though inversions use as prior the output from process-based models, they usually do not use specifically the TRENDY models’ output. TRENDY models and data-driven models also share climate forcing as input. 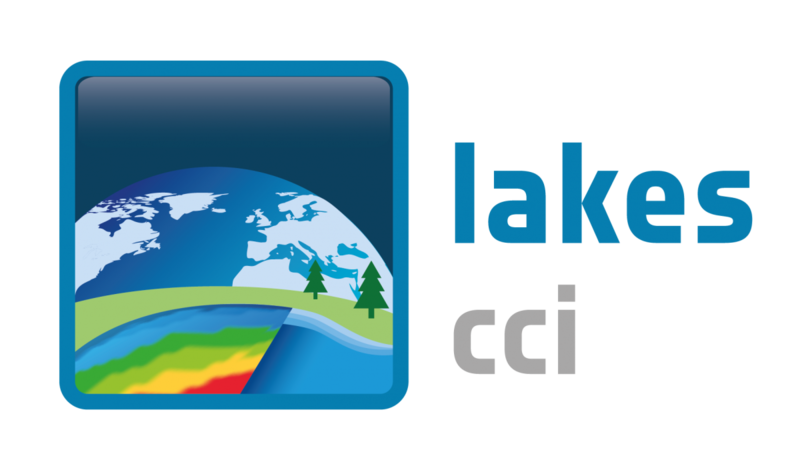 The project will update the output of regional land carbon fluxes from the three approaches each year for the previous year, synchronized with the availability of in situ CO2 data for inversions. ESA CCI available products for burned area, land cover, and soil moisture will be used until 2014 to evaluate the results from TRENDY models. 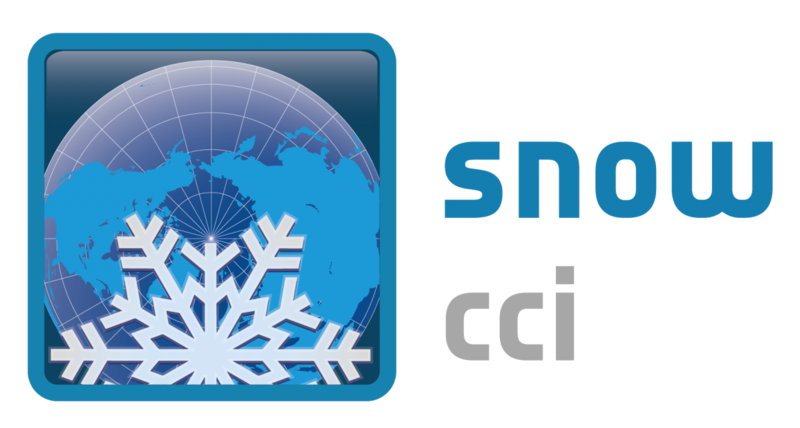 ESA CCI satellite GHG column concentrations of CO2 (XCO2) have been produced by ESA CCI until 2015 and similar retrieval products will be available in near-real-time to perform atmospheric inversions for the period of the project through the Copernicus project CAMS41. The scale of the RECCAP-2 regional analysis will have increased detail compared to those in RECCAP-1. The analysis will also focus on spatially explicit maps of monthly CO2 fluxes from TRENDY, data driven models and from inversions. In this work, we evaluated the response of the terrestrial carbon cycle to the extreme El-Niño event in 2015/16 using atmospheric inversions and land-surface models. Evaluating the response of the land carbon sink to the anomalies in temperature and drought imposed by El Niño events provides insights into the present-day carbon cycle and its climate-driven variability. It is also a necessary step to build confidence in terrestrial ecosystems models' response to the warming and drying stresses expected in the future over many continents, and particularly in the tropics. Here we present an in-depth analysis of the response of the terrestrial carbon cycle to the 2015/2016 El Niño that imposed extreme warming and dry conditions in the tropics and other sensitive regions. First, we provide a synthesis of the spatio-temporal evolution of anomalies in net land–atmosphere CO2 fluxes estimated by two in situ measurements based on atmospheric inversions and 16 land-surface models (LSMs) from TRENDYv6. Simulated changes in ecosystem productivity, decomposition rates and fire emissions are also investigated. Inversions and LSMs generally agree on the decrease and subsequent recovery of the land sink in response to the onset, peak and demise of El Niño conditions and point to the decreased strength of the land carbon sink: by 0.4–0.7 PgC yr−1 (inversions) and by 1.0 PgC yr−1 (LSMs) during 2015/2016. LSM simulations indicate that a decrease in productivity, rather than increase in respiration, dominated the net biome productivity anomalies in response to ENSO throughout the tropics, mainly associated with prolonged drought conditions. Figure 3: Anomalies in terrestrial net CO2 uptake by terrestrial ecosystems during the2015/16 El-Niño event, seen by two atmospheric inversions and an ensemble of land-surface models. This article is part of a discussion meeting issue ‘The impact of the 2015/2016 El Niño on the terrestrial tropical carbon cycle: patterns, mechanisms and implications’. 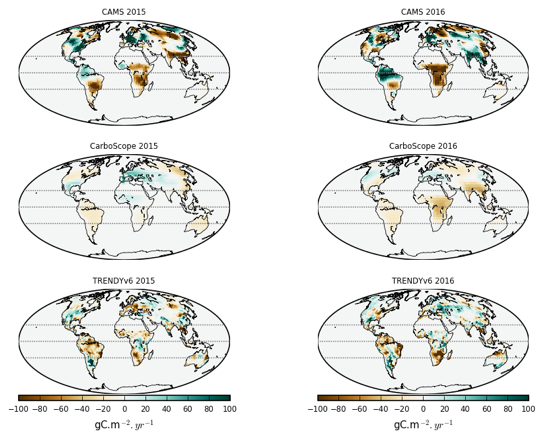 The Global Carbon Atlas allows for quick time-series and map visualisation of the carbon fluxes from the datasets used in RECCAP-2.